MutL and MutS are key components of the DNA repair machinery that corrects replication errors. MutS recognises mispaired or unpaired bases in a DNA duplex and in the presence of ATP, recruits MutL to form a DNA signaling complex for repair. 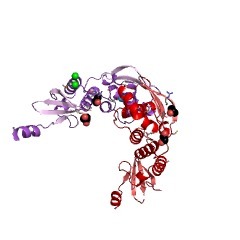 The N terminal region of MutL contains the ATPase domain and the C terminal is involved in dimerisation. MutL and MutS are key components of the DNA repair machinery that corrects replication errors [(PUBMED:8811176)]. MutS recognises mispaired or unpaired bases in a DNA duplex and in the presence of ATP, recruits MutL to form a DNA signalling complex for repair. 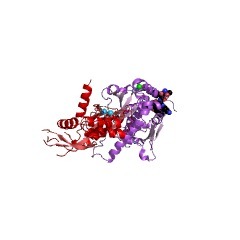 The N-terminal region of MutL contains the ATPase domain and the C-terminal is involved in dimerisation [(PUBMED:15470502)]. 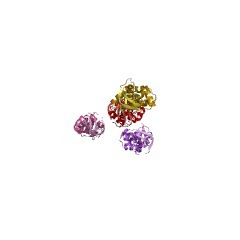 There are 20111 MutL_C domains in 20108 proteins in SMART's nrdb database. Taxonomic distribution of proteins containing MutL_C domain. This tree includes only several representative species. The complete taxonomic breakdown of all proteins with MutL_C domain is also avaliable. Click on the protein counts, or double click on taxonomic names to display all proteins containing MutL_C domain in the selected taxonomic class. 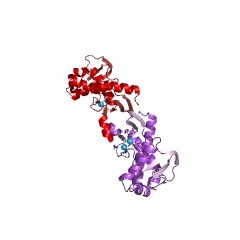 Analysis of the quaternary structure of the MutL C-terminal domain. The dimeric DNA mismatch repair protein MutL has a key function incommunicating mismatch recognition by MutS to downstream repair processes.Dimerization of MutL is mediated by the C-terminal domain, while activityof the protein is modulated by the ATP-dependent dimerization of thehighly conserved N-terminal domain. 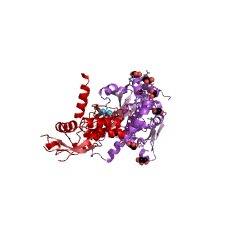 Recently, a crystal structure analysisof the Escherichia coli MutL C-terminal dimerization domain has beenreported and a model for the biological dimer was proposed. In this model,dimerization is mediated by the internal (In) subdomain comprisingresidues 475-569. 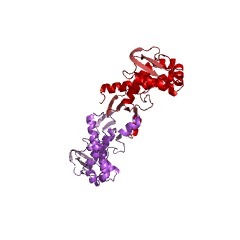 Here, we report a computational analysis of all proteininterfaces observed in the crystal structure and suggest that thebiological dimer interface is formed by a hydrophobic surface patch of theexternal (Ex) subdomain (residues 432-474 and 570-615). Moreover, sequenceanalysis revealed that this surface patch is conserved among the MutLproteins. To test this hypothesis, single and double-cysteine variants ofMutL were generated and tested for their ability to be cross-linked withchemical cross-linkers of various size. Finally, deletion of theC-terminal residues 605-615 abolished homodimerization. 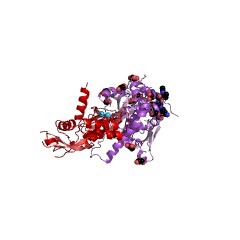 The biochemicaldata are fully compatible with a revised model for the biological dimer,which has important implications for understanding the heterodimerizationof eukaryotic MutL homologues, modeling the MutL holoenzyme and predictingprotein-protein interaction sites. Structure of the MutL C-terminal domain: a model of intact MutL and itsroles in mismatch repair. MutL assists the mismatch recognition protein MutS to initiate andcoordinate mismatch repair in species ranging from bacteria to humans. TheMutL N-terminal ATPase domain is highly conserved, but the C-terminalregion shares little sequence similarity among MutL homologs. 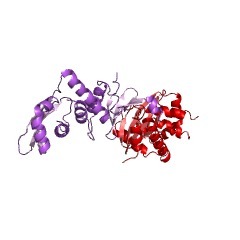 We reporthere the crystal structure of the Escherichia coli MutL C-terminaldimerization domain and the likelihood of its conservation among MutLhomologs. A 100-residue proline-rich linker between the ATPase anddimerization domains, which generates a large central cavity in MutLdimers, tolerates sequence substitutions and deletions of one-third of itslength with no functional consequences in vivo or in vitro. Along thesurface of the central cavity, residues essential for DNA binding arelocated in both the N- and C-terminal domains. Each domain of MutLinteracts with UvrD helicase and is required for activating the helicaseactivity. The DNA-binding capacity of MutL is correlated with the level ofUvrD activation. A model of how MutL utilizes its ATPase and DNA-bindingactivities to mediate mismatch-dependent activation of MutH endonucleaseand UvrD helicase is proposed. Mismatch repair in replication fidelity, genetic recombination, and cancerbiology. Mismatch repair stabilizes the cellular genome by correcting DNAreplication errors and by blocking recombination events between divergentDNA sequences. The reaction responsible for strand-specific correction ofmispaired bases has been highly conserved during evolution, and homologsof bacterial MutS and MutL, which play key roles in mismatch recognitionand initiation of repair, have been identified in yeast and mammaliancells. Inactivation of genes encoding these activities results in a largeincrease in spontaneous mutability, and in the case of mice and men,predisposition to tumor development.